The tranquil south side of Loch Ness has a fantastic walking landscape of small hills, beautiful woodland, waterfalls, and stunning freshwater lochs. Much of the countryside is relatively untouched since we are off the beaten tourist track. 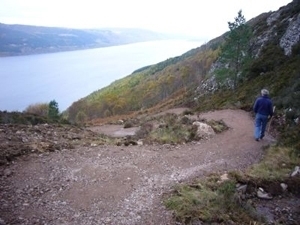 The South Loch Ness Trail is a relatively new trail, 28 miles long, stretching from Tarff, a few miles north of Fort Augustus, to the Torbreck woods on the outskirts of Inverness. Inverfarigaig, only 7 miles from Balachladaich Bed & Breakfast is an excellent starting point for the network of Farigaig Forest walks. Winding up through magical woodland backdrop, passing through several stunning viewpoints, the clearly signed paths end up at the Lochan, Torr An Tuill, at the top, offering exquisite views along Inverness. On the way, you can gaze in awe at the massive crags of Dun Dearduil. There are many other well known walks within easy reach of Balachladaich Bed & Breakfast. South Loch Ness is excellent for cyclists due to the quiet public roads and the huge range of forestry track suitable for bikes. 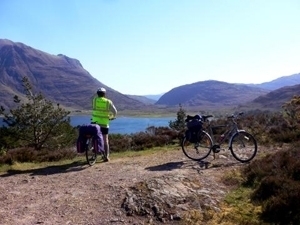 The Trail of the Seven Lochs is an excellent 50 mile loop suitable for horse riders and cyclists with stunning views. Bikes can be hired from Ticket to Ride and delivery and collection is free to/from Balachladaich Bed & Breakfast. 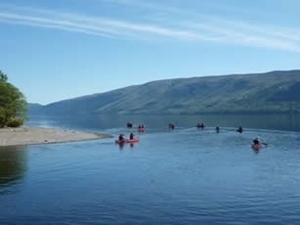 Balachladaich Bed & Breakfast is right on The Great Glen Canoe Trail. Pull your canoe up on our beach, store it in our secure storage, spend the night, and continue on the following day. Boots’n’paddles offer a useful canoe/kayak hire and shuttle service. 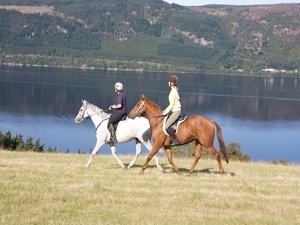 South Loch Ness offers perfect terrain for horse riding, with its good tracks, undulating hills, and quiet public roads. We have grazing adjacent to Balachladaich Bed & breakfast and would be happy to have your horse stay overnight with you. If you require stabling, there is an excellent yard 2 miles away which provides livery, as well as indoor and outdoor arenas. The owner is a qualified teacher and gives lessons to people who bring their own horses. She is often happy to accompany experienced riders on their rides, acting as a guide to the area. Call Candy Cameron on 01463 75251. There are endless fishing opportunities around us, from pike fishing to trout lochs, to the famous Scottish salmon rivers, and from free to very, very expensive. You can get some good advice from J. Graham & Co, an Inverness sporting shop, who sell day licences for a number of places, including the beautiful Loch Ruthven, less than 5 miles from Balachladaich Bed & Breakfast. If you wish to book a fishing tour, Fish Loch Ness runs daily trips of 1.5 hours, in boats with a maximum of 4 passengers. The price includes lifejackets, rods and bait, as well as expert tuition. Trips leave from Drumnadrochit. 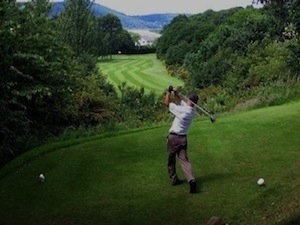 Golfing has become ever more popular in the Loch Ness area since the Scottish Open Golf Championship relocated to Castle Stuart, only a 30 minute drive from Balachladaich Bed & Breakfast. There are several other golf courses nearby for all levels of player. Closest to us is Fairways, which offers an 18 hole course (5,900 yards, par 70) and a 9 hole family course as well as a 19-bay all weather driving range. Whether you are an experienced painter, or simply fancy trying your hand at watercolours, the Loch Ness scenery is bound to inspire you. Balachladaich Bed & Breakfast is the perfect environment to discover your inner creative, but if you would like some more formal tuition, Ros Rowell at Scottish Highland Art (only 8 miles away), runs painting sessions/holidays suitable for absolute beginners or more experienced painters, either individually or in small groups.